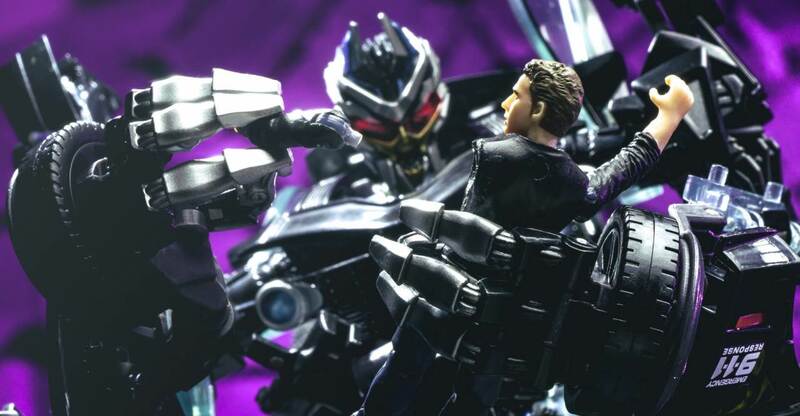 Home » Transformers Masterpiece » TFW2005’s MPM-5 Barricade Gallery Live! TFW2005’s MPM-5 Barricade Gallery Live! Are you username ladiesman 2-1-7? ARE YOU USERNAME LADIESMAN217?!? Where is the eBay item 21153?!? WHERE ARE THE GLASSES! 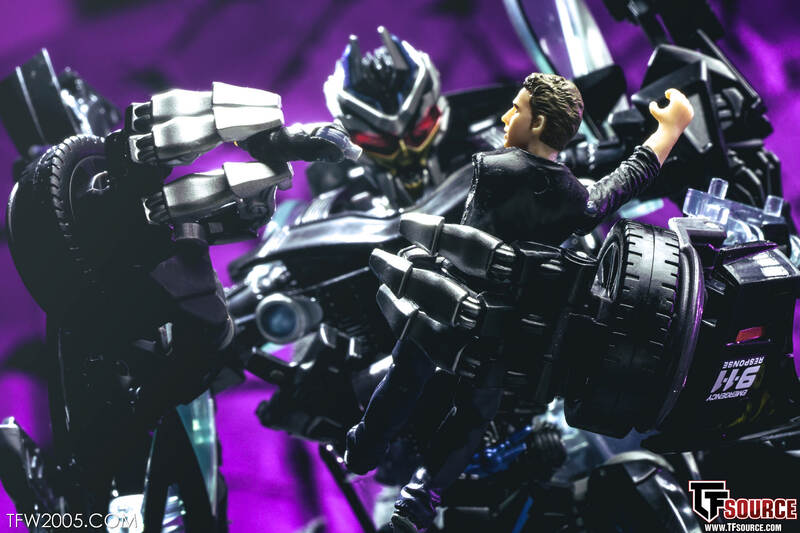 MPM-5 Masterpiece Movie Barricade is finally dropping in mass state side and today we are taking a look at the Decepticon who knows when to get outta dodge! Barricade never seems to go down in the movies, always sneaking away when things are going south. Other than Prime, Megatron and Bumblebee – he’s the only OG who’s made it to movie 5. Now we get his first form in Masterpiece scale, perfectly matched with MPM-3 Bumblebee. The customized Saleen Ford Mustang is done up in his Police deco with all the markings seen in the movies, including the epic “To Punish and Enslave” writing on the side. Light bar, police numbers, the Oklahoma State license plate and even the Saleen logo in the mold on the rear all capture movie accuracy. In bot mode, he captures Barricade’s elongated arms and stocky frame, keeping his alien-esque imposing stance. The transformation is complicated but not insane, and the final result is a Barricade better than the figures that have come before. I personally did not have any QC issues as were present with Bumblebee and Optimus Prime, so hopefully Takara got their stuff together on that front. All in all it’s a well done piece that I am happy to have in the rotation. The movies are now 10+ years old, and I have a bit of a nostalgic streak for these early versions. The MPM line has been a great way to quench that thirst. Hit the link below to check over 90 HD Images! Recent Masterpiece Releases: MPM-6 Ironhide, MPM-5 Barricade, MPM-4 Optimus Prime, MP40 TM Hot Rod, Sunstreaker, Megatron, Dinobot, Masterpiece Pre-Orders. They're close enough in size that this will replace my HA Barricade, though. Although, since he's not saddled with the hollowness of the HA's vehicle mode, it winds up that MP Barricade is virtually the same height as the HA in robot mode due to how much that toy condenses down. But that's just a coincidence. Vehicle mode is significantly smaller. Please forgive my no doubt incredibly stupid question, but I've been away from the boards for awhile, and missed quite a bit – is this the same scale as the Human Alliance line? No. This is a brand new scale. How long were you away for? Git mine yesterday. He is a great figure. There seems to beta seam on the grill that I can't find any infiinf. A main missing something?